Shifting to a new residence was a cumbersome task in earlier days when moving service did not exist. It has never been an easy task to manage and move goods from one place to another. Carrying huge and heavy furniture or even fragile items yourself also gets you tired physically as well as mentally. This is one of the reasons why many people still avoid shifting to new places. But things change with changing lifestyle, shifting has become lot easier than what it was. This has been possible with the help of moving services in Dubai. These moving services are known for facilitating customers with a range of services. Professional movers working with these companies take proper care of your belongings right from packing at old location to unpacking at a new location. Your relocation is smoothly done even without having to lift your finger. But it is important to opt for a company that not only provides moving solution but also looks after packing and storing needs. This allows a customer to find out every solution at a single location. There are quite a few companies that provide all the services and The Box is one of them. The Box is a smart storage company that offers both, moving services as well as storage in Dubai. Their teams of movers are experts at handling and transporting all kinds of goods. 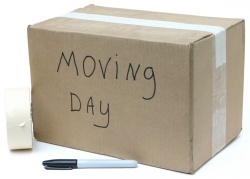 Keep your problems at bay by selecting a group of well-known movers for hassle-free moving. You can also purchase all types of packaging materials at The Box shop.